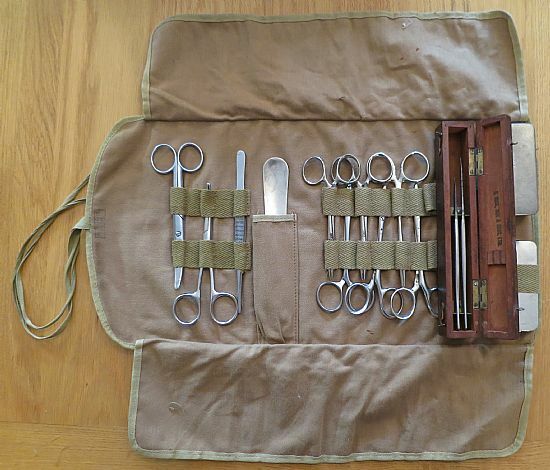 The following pictures give an idea of the type of medical equipment carried and used by 16 PFA during WW2. Above: A Standard Dressing No. 15. Contains one small dressing. 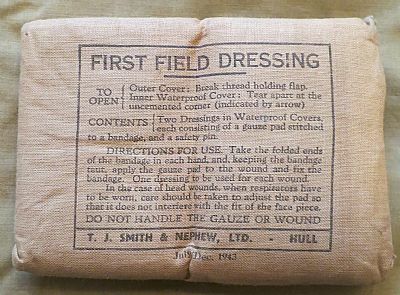 Above: A First Field Dressing, standard issue to all British Soldiers. Contains two small dressings. 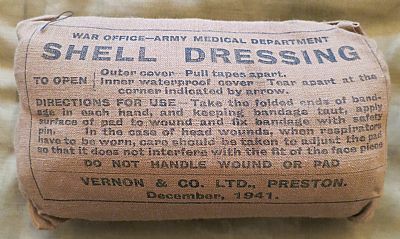 Above: A Shell Dressing. Contains one large dressing. 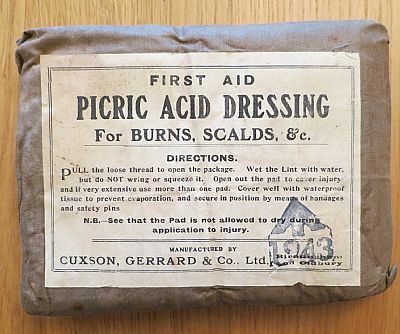 Above: A Picric Acid Dressing for burns. 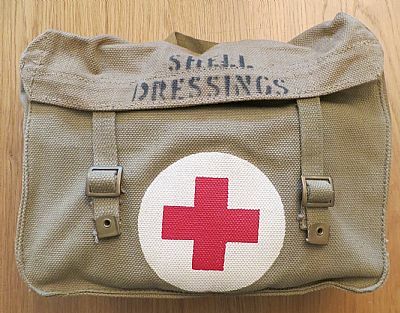 Above: A 1937 Pattern Shell Dressing bag. 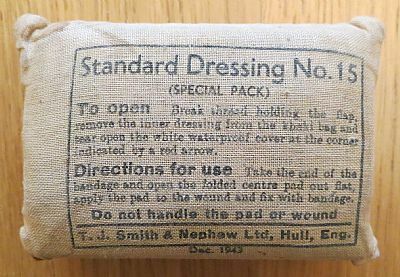 Above: Contents of the Shell Dressing bag, 12 x dressings. 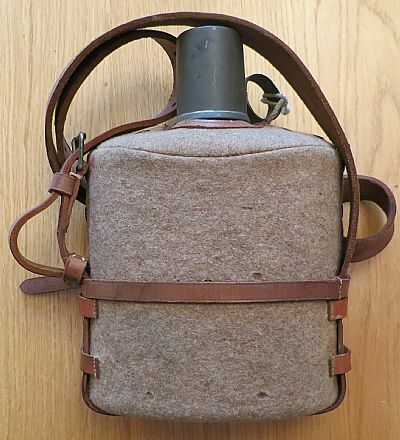 Above: The British Army Medical Waterbottle. 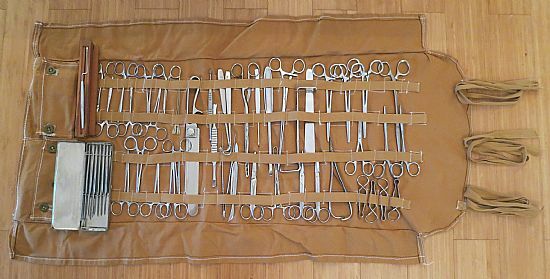 Above: Two 1937 Pattern Stretcher carrying straps. 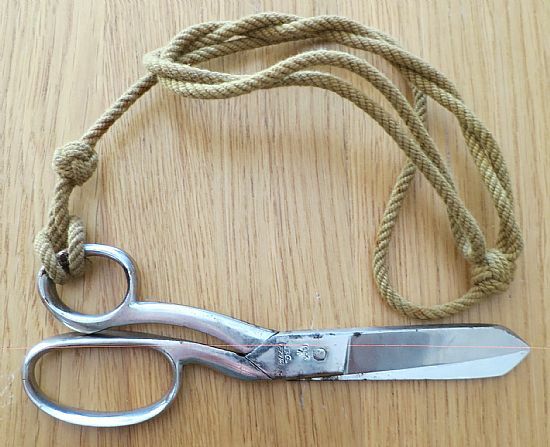 Above: Stretcher bearer scissors & lanyard. 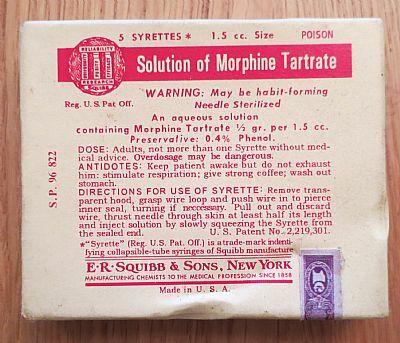 Above: Box of 5 Morphine Syrettes. 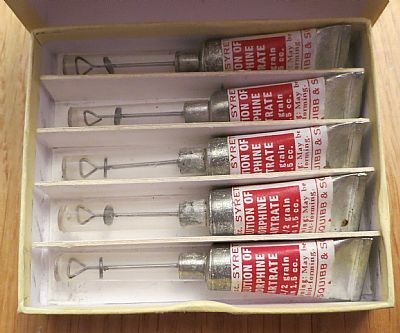 Above: Air Ministry (RAF) Individual Morphine Syrettes, often taken by Airborne troops from aircraft first aid kits to supplement their supplies. 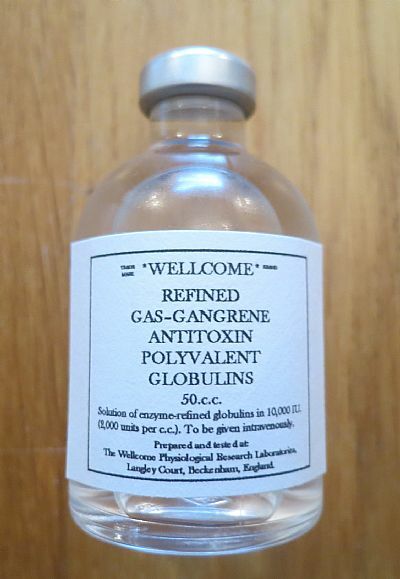 Above: Instructions for use (front). 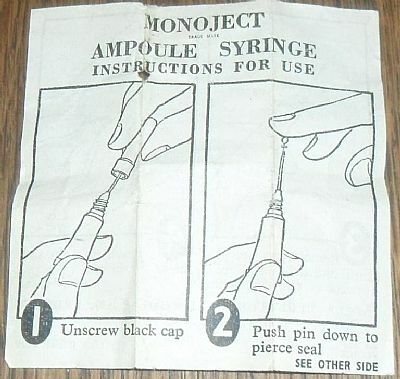 Above: Instructions for use (back). 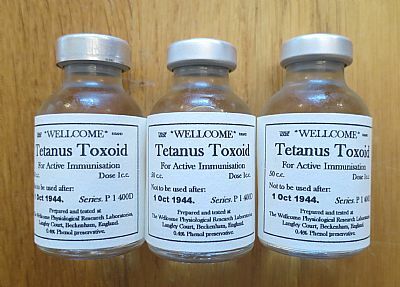 Above: Bottles of Anti-Tetanus Serum. Above: The Singer tourniquet and case. 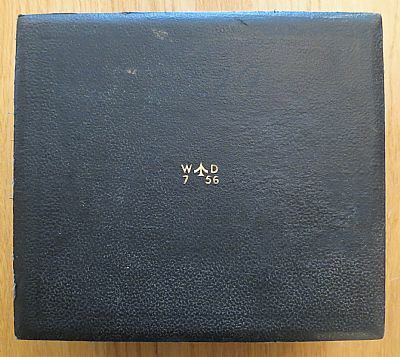 Above: A War Department 1937 pattern operating set. Above: The 1940 Patt. 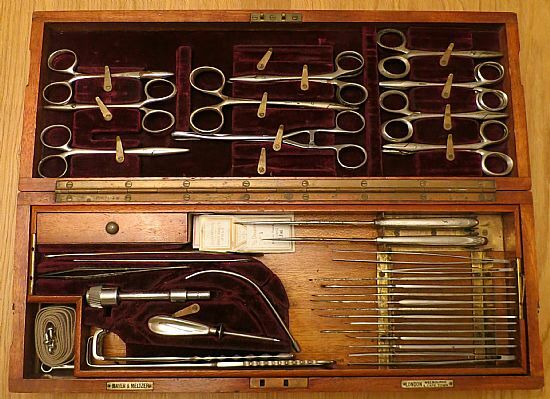 Instruments, Operation set. 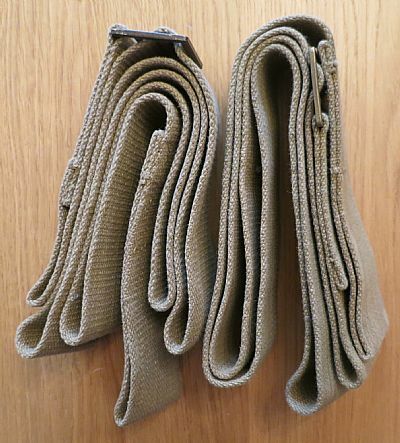 Above: Another example of an instrument roll from the 1940 pattern operating set. 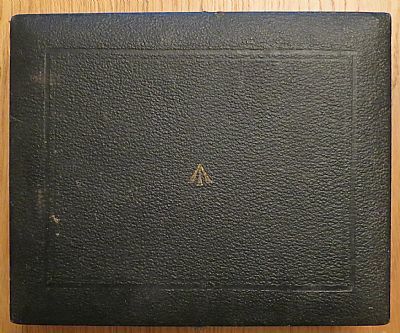 Above: The issue tablet tin from the Regimental Medical Pannier & Medical Companion. 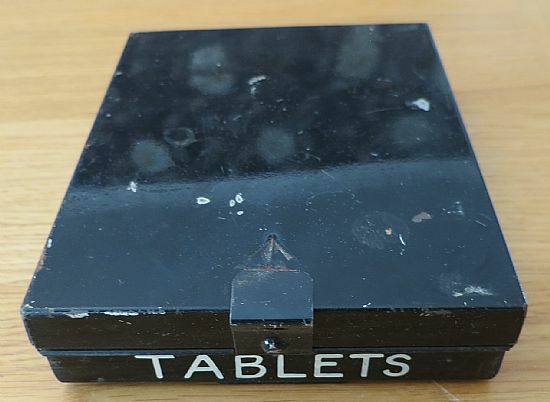 Above: The contents of the tablet tin. 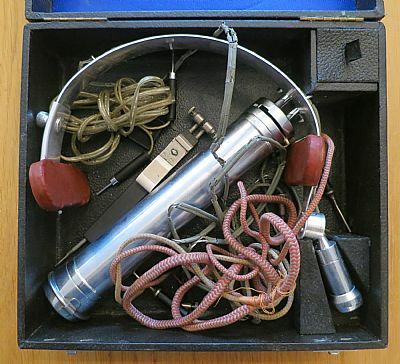 Above: A British Army issue ophthalmoscope. 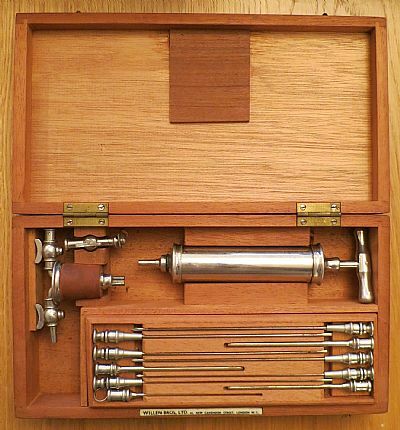 Above: The ophthalmoscope in its case. 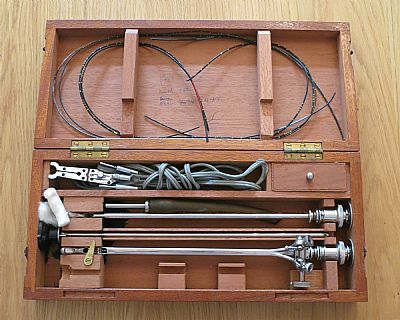 Above: The issue Auriscope/ Otoscope. 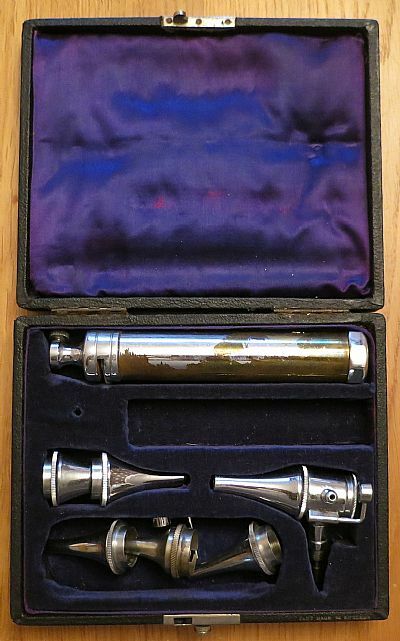 Above: The contents of the issue Auriscope/ Otoscope. Note the empty compartment for batteries. 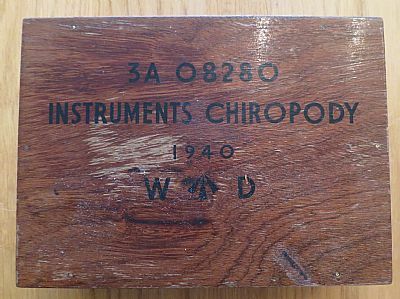 Above: A British Army issue Sphygmomanometer, in bakelite case. 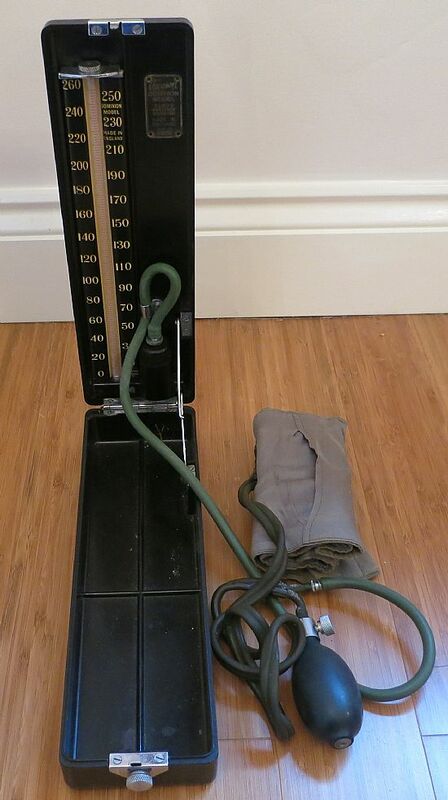 Used for measuring blood pressure. 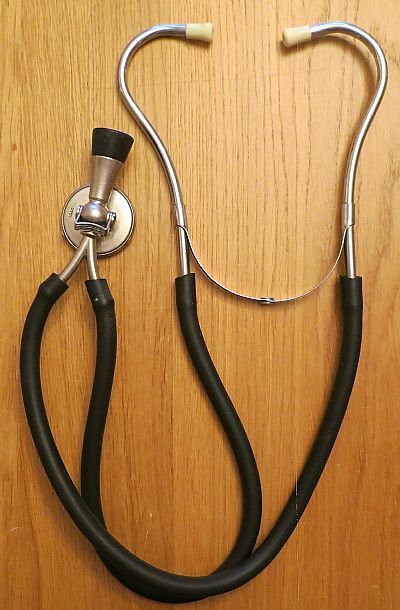 Above: The contents of the Sphygmomanometer. Above: The War Department marked operating head torch. 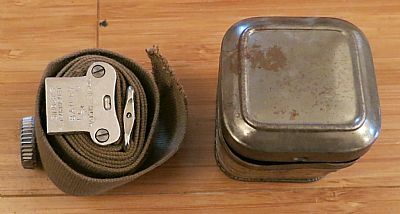 Above: Contents of the British Army issue operating head torch, and battery pack. 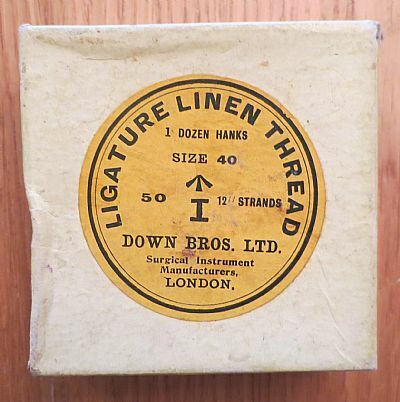 Above: A box linen thread for ligatures. Above: Markings on the Instrument Roll, from the Regimental Medical Pannier. 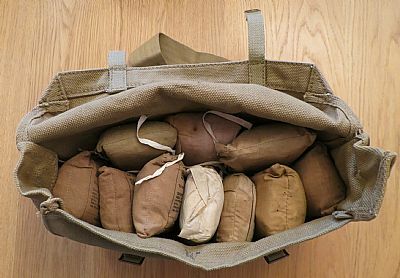 Above: Contents of Roll, Instruments, Regimental Pannier. 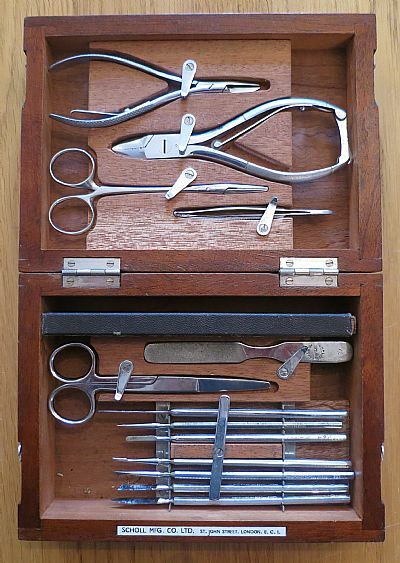 Above: The 1940 Pattern Chiropody set. 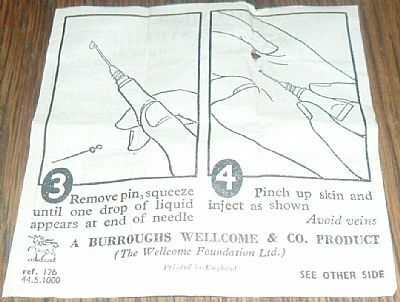 Above: Contents of the 1940 pattern Chiropody set. 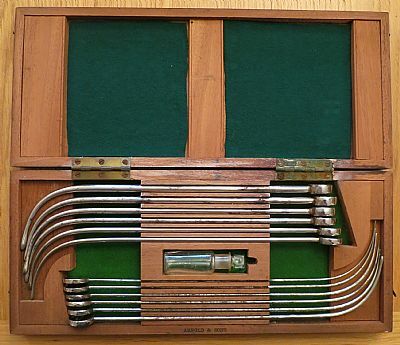 Above: The British Army issue Potains Aspirator set. 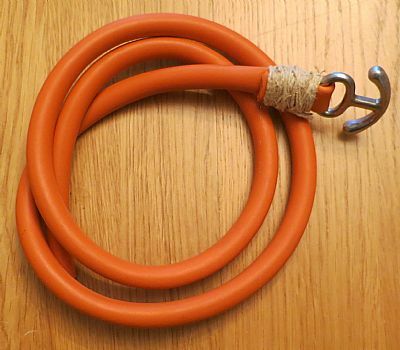 Used for drainage. 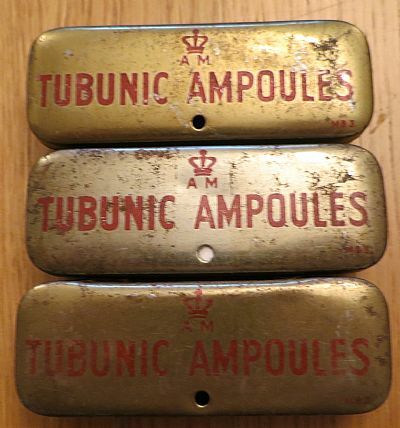 Above: A set of British Army issue urethral bougies.